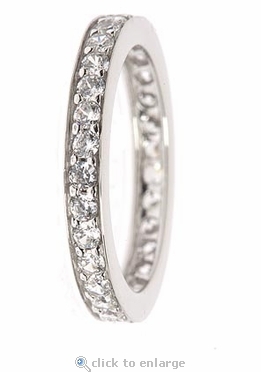 The Pavette Shared Prong Set Pave Round Cubic Zirconia Eternity Band is a traditional band with a single line of rounds that are set in a shared prong setting. Each round is skillfully placed and protected by a fine channel mounting around the entire band. 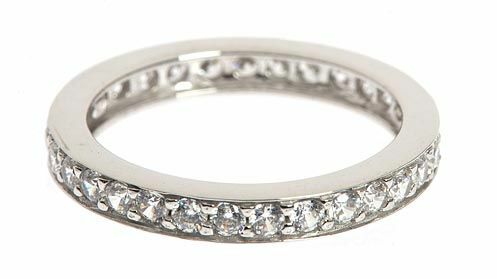 The Pavette Eternity Band measures 3mm in width and has a total carat weight of approximately 2.5 carats, depending on your finger size. 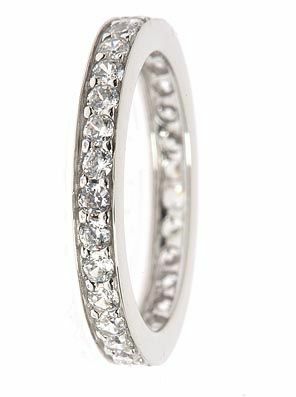 This style of eternity band can be worn with a complimentary solitaire of your choice with one band on each side of the solitaire for the look of a wedding set. You can also wear it as a solitary wedding band or stack two or three together and wear them as stackable rings. Our Russian formula lab created laboratory grown diamond quality cubic zirconia provide you with the best possible stones available with their hand cut and hand polished facets that are cut to exact diamond specifications. Choose from our top quality 14k gold, 18k gold and platinum mountings that are the same high quality mountings used to set genuine diamond jewelry. For sizes not listed in the pull down menu, please call us directly at 1-866-942-6663, and speak with our special order department.